The WebSelf White Label, the solution to reach your customers. A website editor at your name. Create your own plans with your own prices and services. The hosting (by WebSelf) of all your customers' websites. All of the available features in the WebSelf platform (including upcoming features). domain names, emails, number of pages, etc). The technical support by WebSelf to your enterprise. An Administration panel for setting up your White Label. A billing system per site. A choice from over 600 templates. An online help guide (with your brand colors) for your customers. 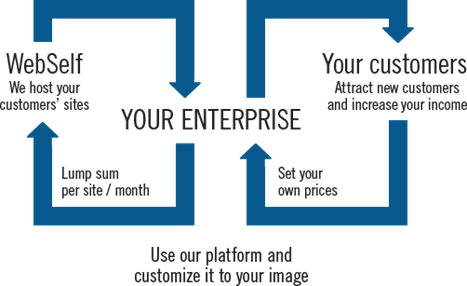 A customisable platform at your own image with your brand colors. A SaaS (Software as a Service) solution that is constantly evolving. A website generator to your colors.